Way back in December 2008, 400 of our friends and supporters gathered in Foxboro, Mass. for the Joe Andruzzi Foundation’s inaugural gala. It was a very uncertain time – not only for the Foundation, but the Andruzzi family as well. Joe had been diagnosed with Burkitt’s lymphoma (an aggressive form of non-Hodgkin’s lymphoma) just 18-months prior to the event and was cautiously celebrating being just over a year in remission. 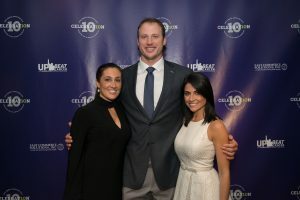 Meanwhile, the Foundation was navigating its infancy – having just launched in May of 2008 – and the gala marked JAF’s first major fundraising event. That night, our friends, supporters, and many of Joe’s former teammates came together for an amazing night to raise just over $200,000 for the Foundation. The most important take away from our inaugural gala, however, was the undeniable sense of community, benevolence, and positivity that had filled the room. The overwhelming support we felt that night validated our notion that our mission resonated with our community and that solving the financial distress that accompanies a cancer diagnosis was a cause others were ready to get behind. We were so thankful for the generosity shown by our attendees, and that inaugural gala set a tone of gratitude that has carried us throughout the years, all the way up to this past Monday night. And what a night it was! We are thrilled to announce that not only did Monday’s 10th Annual Gratitude Gala meet our lofty expectations, it far exceeded them as we raised $1.3 million – a new record for the event! 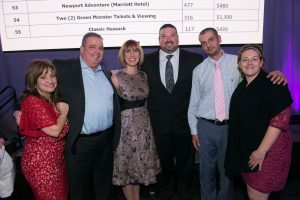 And we owe so much of the event’s success to the collective group that filled Gillette Stadium earlier this week and lifted the Joe Andruzzi Foundation to new heights – led, of course, by our Presenting Sponsor, East Commerce Solutions, Inc., and so many other amazing sponsors, donors, supporters, and our event co-chairs: Lisa & Ed Medeiros and Karen & David Howe. A “Thank You” is also in order for ALEX AND ANI and their amazing Cinematographer, David Bettencourt, who helped us put together two videos that were shown at the Gala. 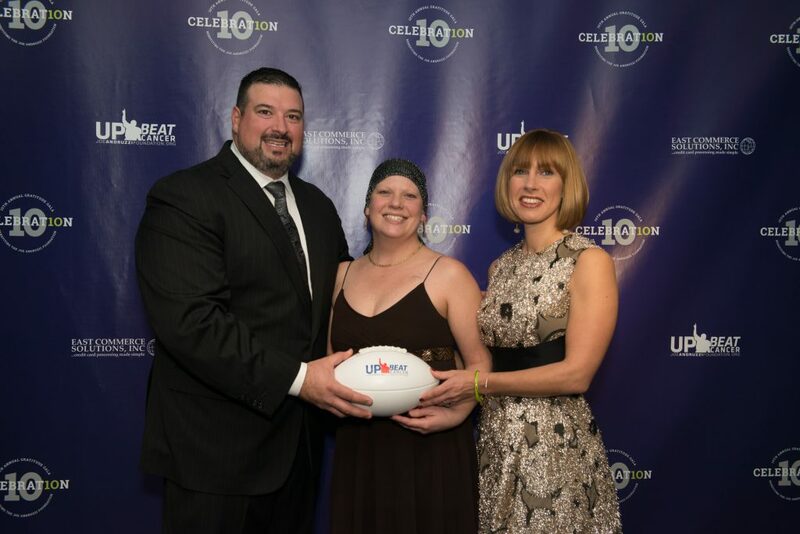 The first highlighted 2017 (Up)Beat Award recipient Dr. Mark Kieran, the Director of Pediatric Neuro-Oncology at Dana Farber Cancer Institute and Boston Children’s Hospital. 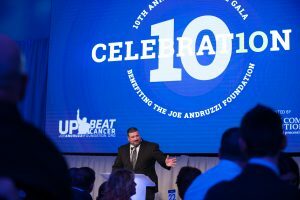 Since 2011, the Joe Andruzzi Foundation has invited its most benevolent sponsors and supporters to attend the Gala to receive the award – which recognizes an organization, team, or individual that particularly embodies JAF’s positive attitude and philosophy. Dr. Kieran was an obvious and deserving choice for this year’s award given his connection to the Foundation – and JAF has proudly donated $850,000 since 2008 in support of his neuro-oncology research at Children’s. Unfortunately, Dr. Kieran could not attend this year’s gala as work called for him to be outside of the country, but the video allowed him to have a presence at the event and accept the award remotely. The other video that played during the event perfectly captured the individuals and stories that have made up the JAF family over the better part of 10 years. The video’s message certainly resonated throughout the Gala, and we are so lucky to have partners like ALEX AND ANI who help support our mission in so many ways. We also want to send a huge thank you to our Gala’s Diamond Sponsors: Bob’s Discount Furniture, J. Derenzo Co., and Suffolk Construction; Platinum Sponsors: CVS Health and The Kraft Group; the current and former Patriots players who came out to support the event; and the Kraft family and Gillette Stadium for welcoming us into their fantastic venue inside the Putnam Club once again. You’re all invaluable in helping us stay inspired and upbeat, and your efforts enable us to assist more patients and families, and fund more research. Of course, we want to give a big thanks to our emcee, CBS Sports reporter Jenny Dell, who once again donated her time to lead our event. Her energy and passion pairs seamlessly with our mission, and we were so lucky to have her with us for the evening. Also, we want to shout out our amazing auctioneer, John Terrio, the Gratitude Gala Committee members, our dedicated Foundation staff, volunteers and JAF’s Board of Directors. Thank you all for everything! Yes, a lot can change in a decade, but the support of our Foundation – and this event – has been unwavering. We realize how rare that level of philanthropic dedication is, and it’s certainly not something we take for granted. If we say it a thousand times it still will never be enough: thank you. P.S. – Be sure to check out the amazing photos from the 10th Annual Gratitude Gala on our Facebook page.